While Sunriver is the perfect place for casual, relaxing bike rides, there are other more challenging options. 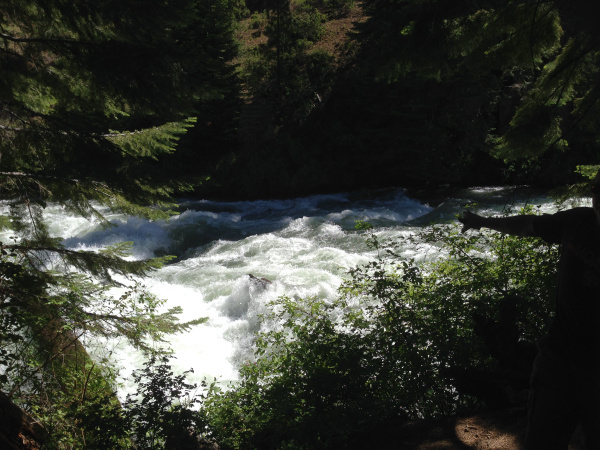 In the past, Bill and I tackled the Deschutes River Trail and enjoyed it immensely. 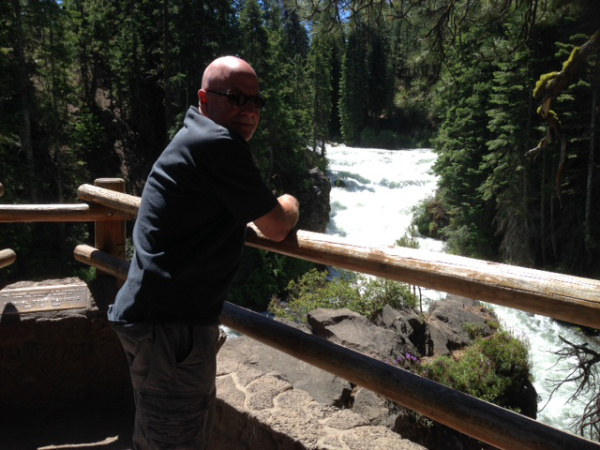 We decided to give it another go in our recent trip to Sunriver. We started at the Benham Falls trailhead in north Sunriver and rode over a few miles of single-track trail littered with random collections of large, sharp rocks. This was sometimes difficult to ride through, and I ended up pushing my bike on a few occasions to keep from scraping my legs on the rocks or nearby trees. It’s a mixture of up- and downhill, so the ride had lots of easy parts too. 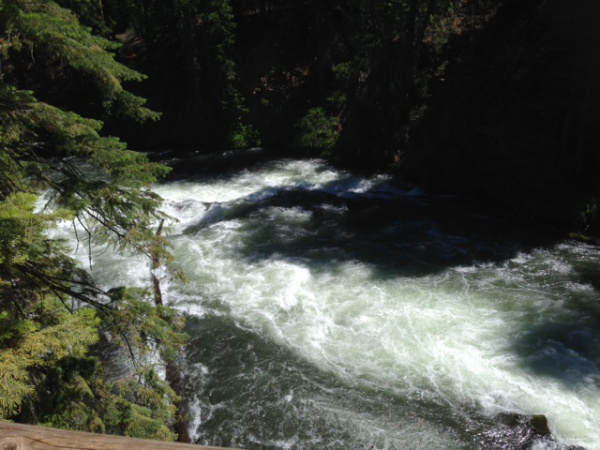 The views of the Deschutes river are beautiful. After a few miles, the trail arrives at Benham Falls park in Lava Lands (which is where Lava Butte makes its home), where the rest of the public can drive and walk a mile to view the falls. The first part of the walk is a quaint wooden bridge. Although you can’t quite see me, I’m at the end of the bridge in the picture above. 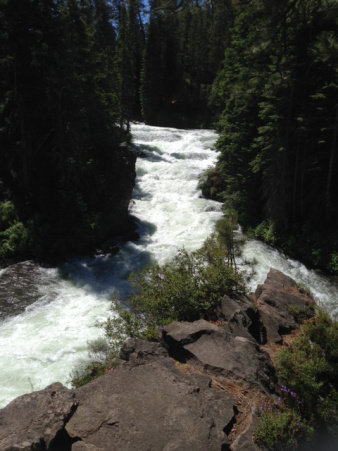 As you approach the falls, the Deschutes leaves the calm waters behind and picks up its fury. The falls are steeper and more intense than they look in this picture. After the falls, the water begins to smooth out again. Bill enjoying a break at the top of the falls. After we saw the falls, we rode another few miles along the river, sometimes along the edge of a ravine directly above the river. What stunning views we saw! We turned around at around seven miles and headed back to Sunriver. On our way back, we were quite surprised to see my parents walking down the trail. They’d already viewed the falls and were starting to think about lunch. So we agreed to rendezvous at one of favorite watering holes, Sunriver Brewing Company in the Sunriver Village. We enjoyed a few pints and a delicious lunch. I fell in love with their Vicious Mosquito IPA! If you pay them a visit, I highly recommend it. After filling our bellies, we headed back to our vacation home for a well-deserved rest in the sun on the back patio. Next Post We Stopped . . .